Thank you for visiting this website about the history of Leechtown. Leechtown is a ghost town on the Southern end of Vancouver Island in British Columbia, Canada. 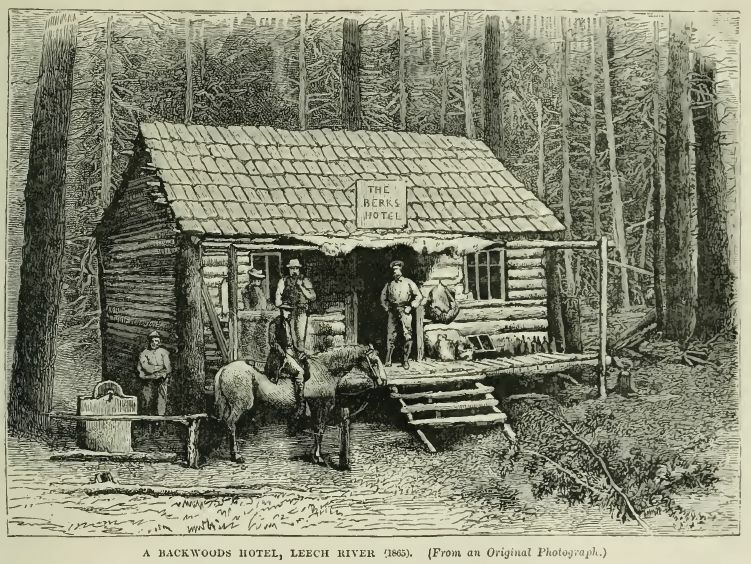 On 18 July 1864 the Leech River was named and ‘payable’ gold was discovered by members of the Vancouver Island Exploring Expedition (VIEE), which led to a gold rush and the establishment of Leechtown. Within weeks after the discovery hundreds of miners travelled towards the new ‘El Dorado’ to try their luck. By 9 November, only four months after the discovery of gold, there were (an estimated) 6 general stores, 3 hotels and over 1,200 miners at work in the area. According to Magistrate Foster of Sooke, there were no fewer than 30 premises licensed for the sale of alcoholic beverages. By 1865 the gold rush had already passed its peak and soon most people moved away. What followed was an era of small scale mining and logging industry that kept the town alive until the late 1950s. Today not much evidence can be found of this once thriving town; however the (now restricted) area still has numerous active placer gold claims. This website is an ongoing work in progress. Although at this stage still incomplete, over time the goal lies in creating a comprehensive source of authentic historical information. In the summary you can already find many new authentic details about the period of the Vancouver Island Exploring Expedition (VIEE) gold discovery on the Sooke and Leech Rivers which led to a gold rush and the establishment of Leechtown. The biographies reveal new and interesting historical information about the lives of the VIEE members of 1864. Since the discovery of gold on the Sooke and Leech Rivers many documents that have been published contain some misinformation regarding this early period. All the information on this website and in the book is authentic and meant to provide the reader with a more comprehensive and accurate source of information about Leechtown and set some historical records straight. Further research is ongoing. In time, if the response is positive (and the energy is there) two or three more books about the history of Leechtown will be written and published, containing the later periods. Please visit the site again for more new information to come.